You guys, spring is in the air! The weather has been in the 50’s this past week and it’s made for some fabulous walks in our neighborhood and trips to the park. One of my absolute favorite flowers I look forward to every spring is Hyacinth flowers. With the weather so fantastic we are on the verge of some of these beautiful flowers sprouting and I simply cannot wait! In our anticipation for all of the beautiful spring bulbs to poke through the dirt, we salvaged some water bottles before putting them in the recycling bin and made this stunning Hyacinth flower craft this week. Friends, I am in love with how it turned out! 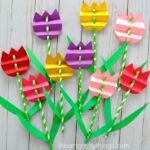 Try coupling this craft with our favorite spring children’s book, Planting a Rainbow Garden by Lois Ehlert. 1. 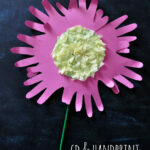 Cut out skinny green stems and glue them onto your light blue cardstock paper. 2. 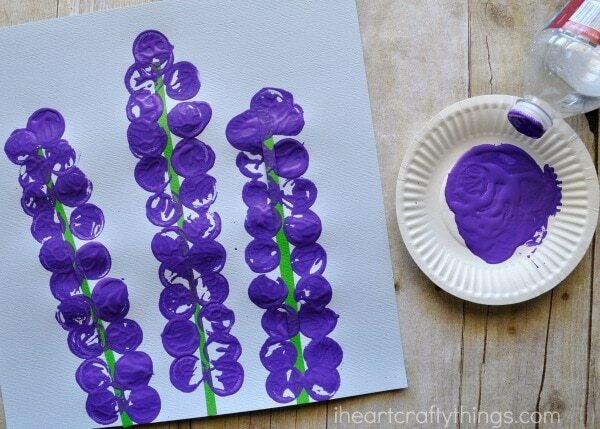 Pour some purple paint onto your small paper plate. 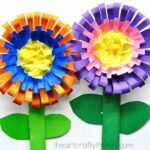 Dip your water bottle lid into the paint and then print it onto your blue cardstock paper, around your green flower stems. 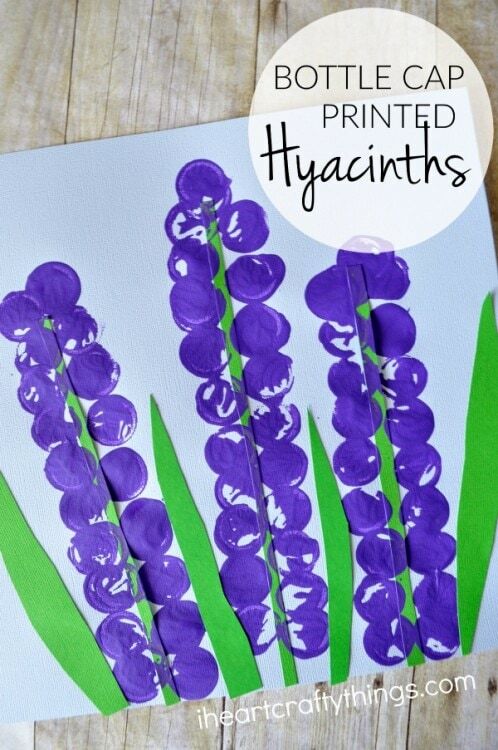 Continue dipping the water bottle lid into the paint and back onto your paper until you have made your pretty hyacinth flowers. 3. 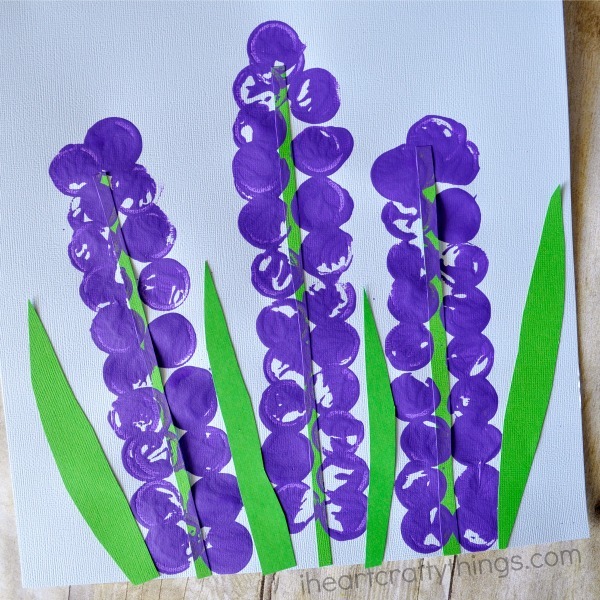 You can leave the beautiful artwork as is or after your paint is dry, you can cut out some leaves from your green cardstock paper and glue them onto the sides of your pretty Hyacinth flowers. 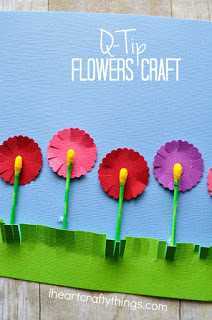 Either way, your new Hyacinth Flower Craft will turn out absolutely stunning! It’s bright and colorful and totally frame worthy! These are awesome. I can also see using this idea for lupines and pairing with Miss Rumphius!